Henry Reed Reads "The River"
In 1970, Henry Reed was recorded reading eight of his poems, as part of a series co-sponsored by the British Council and the Woodberry Poetry Room in the Lamont Library of Harvard University. 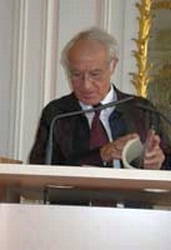 The series was The Poet Speaks, created by Peter Orr, then the head of the Recorded Sound Department at the British Council. Not only were contemporary British and American poets invited to record their work, but they were interviewed by Orr, Hilary Morrish, John Press, and Ian Scott-Kilvert: talking about poetry, the craft of writing, and being a poet (notably among the interviewees, Sylvia Plath). Many of these recordings were released on LP records by Argo Records, starting in 1965. "The River" was published in The Listener on March 26, 1970, along with another of Reed's poems, "Three Words." This recording is reproduced with the generous permission of the British Council, the Woodberry Poetry Room at Harvard University, and the Royal Literary Fund. And there's more. Much more, coming soon! You can listen to other works by Ms. Slavin  including an introduction to "Other Ranks"  on her SoundCloud stream. 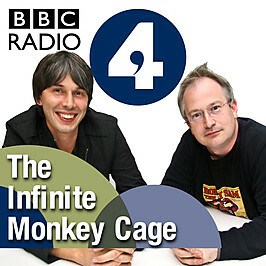 I can't wait to get home and listen to the latest episode of BBC Radio 4's The Infinite Monkey Cage, with Brian Cox and Robin Ince. This week features comedian Dave Gorman, Simon Singh, and Dr. Sue Black, talking about the science of WWII cryptography and Bletchley Park. The episode runs about 30 minutes. Our constant friend, Bruce, directs us to a lecture by Professor Jon Stallworthy, speaking at the Teaching World War I Literature Conference, held at Oxford University Computing Services, in November of 2007. The conference was convened (according to Stallworthy) in order to discuss the teaching of First World War literature in secondary and tertiary education, with special reference to three topics: 1) The relevance, today, of the poetry of the Great War, 2) whether the canon of that poetry should be extended, and 3) the wider topic of war poetry, and how the poems of the Great War should fit into that category. Amusingly, at several points during his presentation, Stallworthy is compelled to admit that he, himself, is at least partly to blame for the continuing over-emphasis on and popularity of First World War poetry. 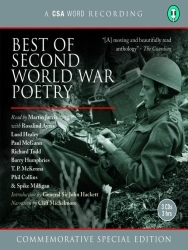 How often have we all had to ask the question, 'Why, when there was so much marvelous poetry from the First World War, was there none from the Second?' The double misperception can only be the fault of an educational system that over-values the one, and is ignorant of the second. If you doubt the accuracy of that statement, consider these facts: First, that in Poet's Corner of Westminster Abbey, a stone commemorating the poets of the Great War carries the names of Laurence Binyon, Wilfred Gibson, Robert Nichols, and Herbert Read, among others. Second, that the Dean of Westminster and his advisors have rejected a proposal that a similar stone, commemorating voices from the Second World War, should be erected to carry the names of four much better poets (of whom I'll have more to say, later): Keith Douglas, Sidney Keyes, Alun Lewis, and Henry Reed. Curiously, I can't find any other references to the proposed memorial for World War II poets. That would be a big deal! Do you know anything about it? One of the saddest experiences I have had was to observe the decline of the poet Henry Reed in the latter part of his life. He became a recluse in his London flat, reluctant to accept any invitation, producing nothing. Apart from the frequently anthologised 'Naming of Parts' and the occasional reference to one of his radio classics such as Hilda Tablet, the so gifted Henry was, it seemed, by the world forgot. I was therefore delighted when Collected Poems of Henry Reed, edited and introduced by Jon Stallworthy (Oxford), appeared this year. Here at last are the Arthurian and classical poems, the Leopardi translations, and poems from the radio plays, all of them where they belongwith The Lessons of War. Now we need the same excellent job done for Reed's prose. It definitely sounds as though Mr. Curtis was a friend of Reed's. Oddly enough, finding his praise in Factiva, I discovered the database offers a text-to-speech service (.mp3), from ReadSpeaker (Reed speaker?). There's a brief advertisement before the article begins. In the 1960s, the British Council teamed up with the Harvard Library Poetry Room to record contemporary British and American poets reading from their own work, and in interviews discussing poetry and the process of writing. English poets who participated in the project included John Betjeman, C. Day-Lewis, William Empson, Hugh MacDiarmid, Louis MacNeice, Kathleen Raine, Stephen Spender, John Heath-Stubbs, W.R. Rodgers, and Vernon Watkins, to name just a few. Interviews were conducted by Ian Scott-Kilvert, Hilary Morrish, Peter Orr (head of the British Council's Recorded Sound department), and John Press. A few details are mentioned in "Poetry, for Crying Out Loud," a 1999 Independent article. 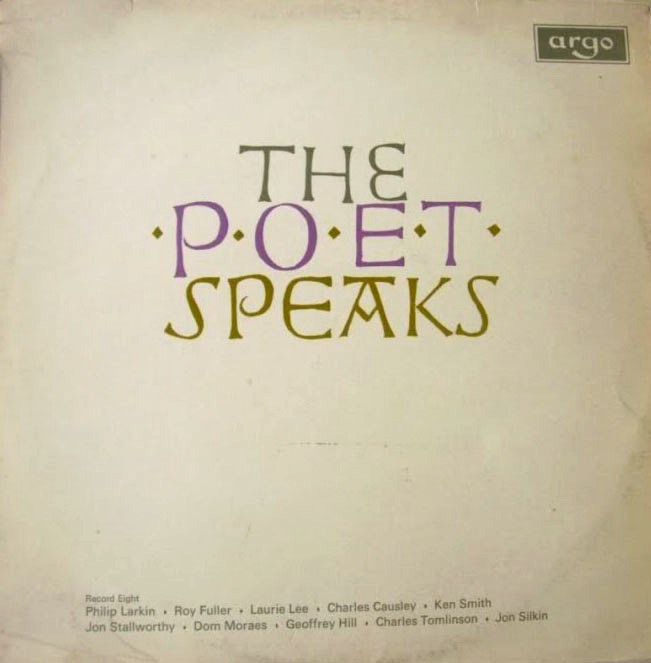 The final product of these recordings was a set of ten LP records released by the Argo Recording Company, along with an accompanying book of transcripts called called The Poet Speaks: Interviews with Contemporary Poets (London: Routledge, 1966). The project didn't end when the record collection was produced, however, because we can find recordings of a 1970 interview with Henry Reed, both at the British Library Sound Archive, and at Harvard's Poetry Room: "Interview with Henry Reed sound recording, by Peter Orr, British Council Recorded Sound Dept., June 11, 1970." Alas, the Reed interview was too late to get included in the Poet Speaks project. The Woodberry Poetry Room at Harvard has one of the largest collections of recorded poetry in the world. Sadly, they provide only a few links to select recordings on their homepage (and several of those do not seem to be working, currently). I think Zhopa Novy God (MySpace) is my new favorite Russian festive brass band. Their track, "St. Petersburg is More than Twice as Little as Moscow" (YouTube), defines everything I love about Russian festive brass. One of the things I really wanted to know, when I listened to Oscar Williams' Album of Modern Poetry (1959), was whether or not Reed's "Naming of Parts" was different than the other recordings I had already heard on other albums. For instance, the Smithsonian Institution's Global Sound offers 99¢ downloads of audio samples and music from almost every country in the entire world; offering everything from tribal music to fiddle tunes, including spoken word records. It's an amazing cultural archive. 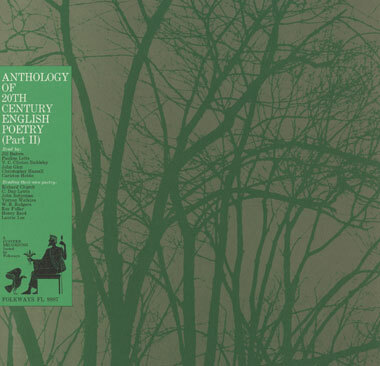 One album in particular, Folkways' Anthology of 20th Century English Poetry (1961), has poetry by Reed and his contemporaries John Betjeman, Roy Fuller, Laurie Lee, C. Day Lewis, W.R. Rodgers, and Vernon Watkins. The liner notes for Part II (.pdf) state that these recordings were 'directed by V.C. Clinton-Baddeley, and made by Edgar A. Vetter at 22b, Ebury Street, London, S.W.1, Summer 1958' (Google Maps). I've listened to "Naming of Parts" on both the Anthology of 20th Century English Poetry and An Album of Modern Poetry, and I can safely report that they are definitely two different recordings. Not just different: the Smithsonian's copy of "Naming of Parts" is vastly superior in terms of tone, quality, and clarity. It does sound a bit like he's reading in an empty Tube station, but (in my opinion) Reed gives a more powerful performance on the Folkways' record. The track is only 99¢, and you can get the whole album for just $9.99. But you don't have to take my word for it. You can join Smithsonian Global Sound and listen for yourself, or just explore what they have to offer. A quick search for "poetry" brings up 59 albums, and 801 tracks! Last September, I mentioned discovering a letter to Henry Reed in the collection of Oscar Williams' correspondence at the Lilly Library in Indiana. The letter was from Henry J. Dubester, and was among a group of letters addressed to British and American poets, including Auden, William Empson, Frost, Roy Fuller, Archibald MacLeish, Roethke, and Stephen Spender (amidst many others). I wondered, at the time, what Mr. Dubester was doing, writing to so many prominent poets? I was promoted and served as Assistant and then Chief of the General Reference and Bibliography Divisions of the Library of Congress. The Poetry Office was one of the sections of the Division. The Library also had a recording laboratory where recordings were made and preserved of many individuals, including poets. I had the opportunity of compiling a set of records with a selection from those recordings. Oscar Williams was my consultant who advised me on the selection. Following his advice, I contacted the poets and solicited their permission to include the text of their recorded poems with the (3) record album. Mr. Dubester is referring to the Library of Congress Recording Laboratory's An Album of Modern Poetry: An Anthology Read by the Poets (1959), a set of recordings of the best 20th-century poets reading from their own work, edited by Williams. My library actually owns these records, although I had to request them from the storage facility where they cache the more outdated or under-utilized materials. The library also possesses a spectacular media lab of its own, replete with soundproofed recording booths stuffed with just the right gear for analog-to-digital conversion. Which is? An ancient turntable plugged into a Mac. So I snuck away for an hour today, and lifted the tracks of "Naming of Parts" and "Judging Distances" from Williams' Album of Modern Poetry. 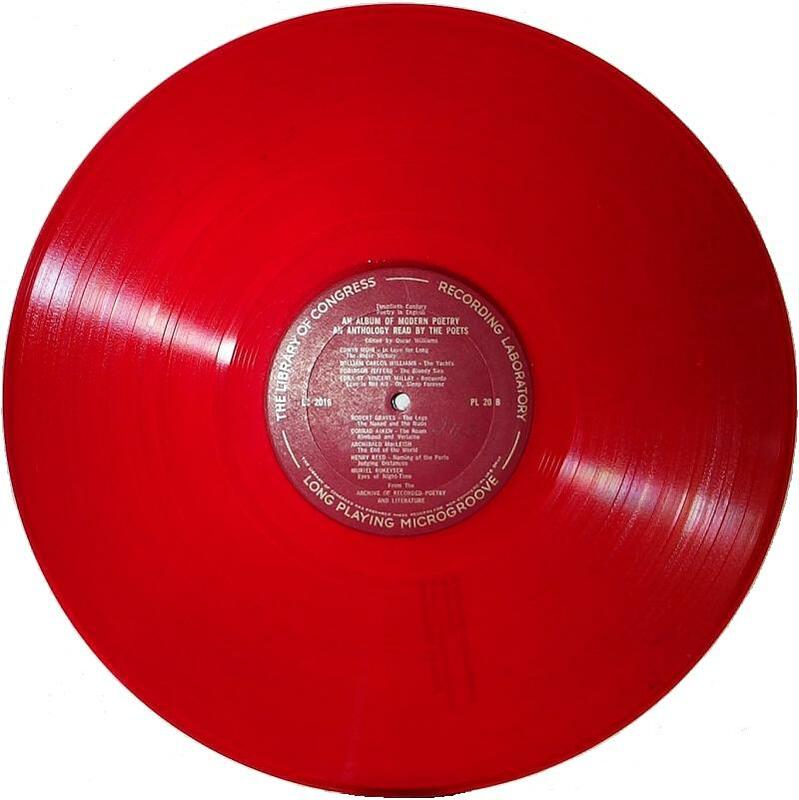 The boxed set is three 12", 33 1/3 microgroove LPs, pressed into a vinyl the color of which there is no word for in English ("vermillion" does not adequately convey the records' ethereal translucence). As Mr. Dubester promised, the set includes a wonderful, 41-page printed anthology of the poems being presented by their authors, as well as an introduction from Oscar Williams on the box. And, I did enjoy a wonderfully surreal moment, when I heard Conrad Aiken's voice booming from the lab's speakers, repeatedly referring to Rambo, Rambo, Rambo, before I realized he was talking about Rimbaud. But, enough. The website of one of my favorite books of poetry to browse on rainy days (and least favorite to try and lug around), The Norton Anthology of English Literature, has a few dozen audio samples of poets reading from from their own work, and others'. The 20th century is represented by poets like W.H. Auden ("Musee des Beaux Arts"), Eavan Boland ("That the Science of Cartography Is Limited"), Ted Hughes ("Pike"), Philip Larkin ("Aubade"), Edith Sitwell ("Still Falls the Rain"), and Dylan Thomas ("Poem in October"). There are also examples of poems from other periods to have a listen to, including the Middle Ages (Seamus Heaney reading from Beowulf), the 16th and early 17th centuries, the Restoration and 18th century Romantics, and the Victorians. While I'm at it, check out this page of poems at the BBC: Poetry Outloud. That's "Rafe," not "Ralf." Rrrrafe. Roll your "r": R-r-r-r-r-rafe. On a fansite for Ralph Fiennes, there's a "Poetry Corner" page, which collects recordings of the actor reading all sorts of verse, from Shakespeare to Kipling to Pablo Neruda. This, in itself, is not surprising. But I was left completely nonplussed to discover Ralph Fiennes reading "Naming of Parts" (.mp3). He does the two voices, and everything! Just when you thought the Internet wasn't, y'know: good for stuff. The poem appears under a section for BBC Radio 4's program, "Poetry Please," so I have to assume this to be the recording's origin. The section also includes Fiennes's interpretations of Keith Douglas's "Vergissmeinnicht," and John Gillespie Magee's "High Flight." On March 29th, 1955, the BBC's Third Programme broadcast for the first time Henry Reed's radio play, Vincenzo. The play, advertised as a "tragi-comedy," was something of a prequel to Reed's 1952 The Great Desire I Had. Both plays recount episodes in the life of Duke Vincenzo I of Gonzaga (Wikipedia article), patron of the arts and ruler of the Italian Duchy of Mantua from 1587 to 1612. The London Times called the play "splendidly acted," and "the happiest association of playwright and players" (March 31, 1955, p. 10). It was produced by Douglas Cleverdon, with music by Denis Stevens. It stars Hugh Burden (Internet Movie Database) as Vincenzo, Rachel Gurney as Ippolita Torelli (later of Upstairs, Downstairs), Gwen Cherrell as Margherita Farnese, Barbara Lott as Eleanora dé Medici, and Barbara Couper as Agnese del Ceretto. The music was arranged by Denis Stevens (Guardian obituary) from the work of Mantuan composers of the period, including Claudio Monteverdi, the Italian master who was Stevens' particular passion. Monteverdi's patron was none other than Duke Vincenzo. The play traces Vincenzo's life from his eighteenth year until his death in 1612, framed in "choric narration" (Savage, "The Radio Plays of Henry Reed") spoken by his wives and mistresses.